Sacraments are a visible signs of God’s presence in our lives and are celebrated publicly in our faith community. The sacrament of marriage is a religious, liturgical celebration that celebrates not just the union of two people but also God’s unconditional love for us. Liturgical celebrations are the prayer of the entire church and include active participation of all present. At least one party (bride or groom) must be a practicing Catholic. Both the bride and groom must be canonically free to marry. Only a Catholic ceremony may be performed. Inquiries as to dates and times for wedding at St. Philip Neri or St. Anne are to be made through the pastor at which time preliminary questions will be asked to determine your freedom to marry. Do NOT rent halls, order invitations, or hire a band/DJ etc., until your wedding date has been confirmed by the pastor or parish office. Wedding Date – A minimum of six months preparation time is required. Before contracting for a hall, band, etc., be sure to set your date with the pastor as far in advance as possible. If either person has been previously married, no date will be set without a decree of nullity or a death certificate. Weddings typically take place on Saturdays but may be scheduled on Fridays and/or other days in the week except Sundays. Generally, weddings are not scheduled during the Season of Lent. Wedding Time – Saturday weddings may be scheduled any time up to 1pm for full Mass celebrations and up to 2pm for non-Eucharist celebrations. Pre-marriage Instruction – This is a major part of the preparation. All couples are required to attend a Pre-Cana/Engaged Encounter day or weekend. Please check with the pastor for availability of dates, times and places these take place. Documents – A Certificate of Baptism must be obtained and given to the pastor. Baptismal certificates should be dated no earlier than six months prior to the wedding date. Baptismal certificates can be obtained from the church where you were baptized by calling the church of baptism’s office. If there is a non-Catholic party (if baptized), he/she must also provide a Certificate of Baptism. In the case of a mixed religion marriage, the Catholic party is asked to sign a statement promising to live his/her faith, to respect the faith of the partner, and the desire to baptize and educate the children as Catholic to the best of his/her ability. If one or both parties were previously married, the annulment process must be completed before a wedding date can be set. A marriage license from the State of Michigan must be obtained. This is available at the county clerk’s office in the county where you reside in Michigan and is valid for 33 days from the day you apply. There is a waiting period of three days after applying, so allow for sufficient time. If you reside outside the State of Michigan, apply at the county clerk’s office in the county where you will be married. Contact the county clerk’s office ahead of time as procedures seem to vary county by county. The marriage license must be at the Parish Office 3 days prior to the date of the wedding. Rehearsal – All couples, together with the wedding party and assisting ministers (readers/ushers, etc.) meet with the priest to rehearse the wedding ceremony. This is scheduled for the evening before the wedding or a mutually agreed upon date and time. Ceremony – It is your responsibility to plan out your ceremony. A booklet, Together for Life, or an equivalent booklet, will be provided to help you choose your readings, prayers, etc. Inter-Faith Marriages – When one of the parties is not Catholic, the Church recommends performing the Rite for Celebrating the Marriage Outside of Mass. This is done in consideration and respect of the non-Catholic party and family members as well as our understanding of the Sacrament of the Eucharist. Plan for approximately 1 hour if Mass is celebrated or 45 minutes if not. However, consultation with the presider will determine the final plan. 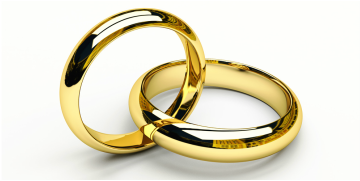 Liturgical Ministers – There is a place for two people to do the reading during the wedding. Two criteria should be considered in making the choice of who will be doing this: Are they good readers and are their lives consistent with what they are reading? Altar servers are not needed; however, if you have someone in mind to serve, it is permitted. Involvement of family members and friends is encouraged. Very young children in roles of flower girls, ring bearers, “miniature brides and grooms” is strongly discouraged. Music – Music adds both dignity and beauty to the wedding ceremony. As soon as the date is set, musicians should be contacted. Mary Park (231-832-5139) is the head minister of music at St. Philip Neri and Pat Maguire (231-796-4720) at St. Anne. Either may play at both churches. If you wish to have a singer(s), they can provide you with names. If you plan to have someone other than one of these two musicians, you should discuss the musical selection, use of parish instruments, microphones, etc. with the pastor. He may, in turn, refer you to another minister for assistance. Remember that this is a prayerful celebration. You have chosen to begin your married life in the context of worship. All music selected shall be of a sacred nature befitting a liturgy. Popular secular music should be reserved for the reception. Dress – While formal dress for bride, groom and wedding party remains popular, it is not required. Whatever form of dress is chosen, it should reflect the norms of good taste and be appropriate for a sacramental wedding (i.e. low cut dresses, dresses with no backs, etc. are not appropriate. Men may wear “Sunday attire” or tuxedo if preferred. Decorations – Simplicity should be kept in mind. Care must be taken to insure that no damage is done to church furnishings. Pew bows must not be taped or tacked to the pews. Candelabras must have plastic under them in case of dripping wax. If flowers are used in front of the ambo and/or altar, they can not be taller than the furnishing themselves. Balloons are not permitted. The worship area is decorated appropriate to the liturgical season. These items may not be changed for sacramental celebrations, including weddings. These items include, but are not limited to banners, altar cloths, etc. Decorations should never impede the approach to or the encircling of the altar, or any movement and action. NOTHING that is already present can be moved without permission of the pastor or coordinator. The unity candle lighting is an option in the ceremony. The parish does have a stand for use. The couple shall provide the candles. The candles may not be placed on the altar. Assistance can be provided in obtaining candles. Due to liability and safety concerns, aisle runners are not permitted. Photography / Video – They are welcome but must not distract from the ceremony. The photographer should meet with the pastor prior to the wedding. Facility use – Decorating and other preparations for the wedding may begin no earlier than 3 hours before the ceremony is scheduled to begin. Couples are asked to designate a person(s) to clean up their materials after the wedding. The church should be left in the same order as it was found before the wedding. No rice, confetti, birdseed or similar substances may be thrown on the church property, sidewalks, entry or in the church building before, during or after the wedding. Smoking, drinking and eating is not allowed in the church/vestibule. No smoking is allowed indoors. Alcoholic beverages are not permitted!! The church must be cleared by 4:00pm. In the event there is a funeral on the day of the wedding, the church will not be available for preparations until 12:00pm (noon). As much advance notice as possible will be given. Fees – There is no fee for the use of the church for register and active members of St. Philip Neri and St. Anne parish. Bride, groom or immediate family members must be registered, active parishioners at least one year prior to the wedding to qualify. It is the responsibility of the members to support the church financially, and the responsibility of the church to support its members by providing for their sacramental and spiritual needs. If you wish to make a gift to the parish and/or presider, it is gratefully accepted but not expected. Non-members wishing to be married at St. Philip Neri or St. Anne are required to pay $200 for use of the church payable when the date is set and are responsible for finding a priest to celebrate their wedding. There is a fee of $150 for a coordinator who will be present at the rehearsal and wedding to assist. All fees are payable to St. Philip Neri or St. Anne Church. Music ministers should be paid a minimum of $50 each. If they must learn new music or work with a different vocalist, the amount should be increased. Conclusion – These guidelines are set forth to aid couples in the planning and preparation of their marriage. It is not the intent of the parish for couples to feel that heavy restrictions are being placed upon them. The marriage commitment brings about the beginnings of a new family. This commitment is not only to each other but to the family of God.